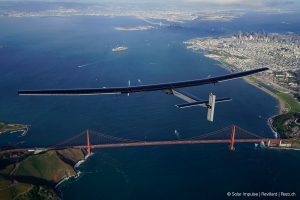 Mountain View, USA, April 23, 2016: Solar Impulse landed at Moffett Airfield, completing the Pacific crossing. Departed from Abu Dhabi on March 9, 2015, the Round-the-World Solar Flight took 500 flight hours and covered 35,000 km. 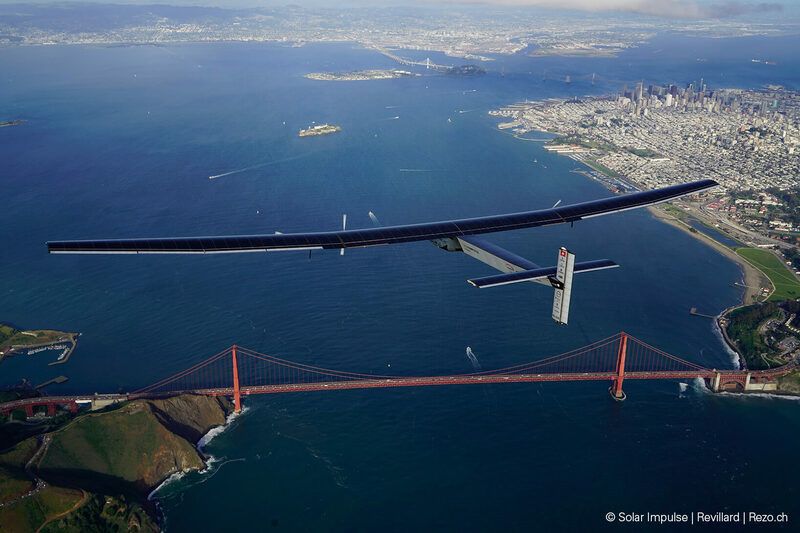 Swiss founders and pilots, Bertrand Piccard and André Borschberg demonstrated how pioneering spirit, innovation and clean technologies could change the world. The duo took turns flying Solar Impulse 2, changing at each stop and flew over the Arabian Sea, to India, to Myanmar, to China, across the Pacific Ocean, to the United States, over the Atlantic Ocean to Southern Europe or Northern Africa and completed the journey by returning to the initial departure point. Landings were made every few days to switch pilots and organize public events for governments, schools and universities. SCHAUMBURG, IL (August 2016) – Recently the Solar Impulse 2 airplane finished its flight around the globe, with airtime lasting over 500 hours and is the first plane to do so relying entirely on Solar Energy. With an ETEL motor inside, the Solar Impulse 2 successfully started in Abu Dhabi and flew across Asia, the Pacific Ocean, the United States, Atlantic Ocean, and Europe before heading right back where it started. This is a remarkable achievement, not just in the industry of aviation but for the idea of clean energy as a technological driving force. The Solar Impulse 2 airplane was designed to have optimum performance-per-weight ratio so every component, down to the smallest of screws was made to be as light as possible. The task of contributing a proper motor that met these demands was a goal ETEL was more than able to achieve. A number of years ago ETEL was asked to contribute its expertise in direct drive technology to create a motor capable of an efficiency above 95% which proved vital in ensuring the solar power absorbed by the panels was made the most out of. ETEL proved to be the supplier that was able to provide the highest quality motor and that expertise continues to be incorporated into their own standard product line of direct drive motors and motion stages. Through a partnership with many vendors, the Solar Impulse 2 team was able to achieve their goals and ETEL is proud to be a part of this accomplishment. In the end, the airplane proved to successfully combine the most advanced scientific knowledge in terms of aeronautics, materials, photovoltaic energy, and electrical motors. The ETEL motor used in the Solar Impulse 2 airplane is a torque motor characterized by having an optimized force density and unmatched current efficiency. It is based on the same technology as the parts every ETEL customer receives. The motor in the Solar Impulse 2 is obviously slightly modified to support the extreme environmental conditions that are unique to this challenge, but the heart of the motor and its magnetic technology is currently ensuring the proper operation of thousands of machines around the world. ETEL S.A. is based in Switzerland with exclusive North American distribution through HEIDENHAIN CORPORATION at 333 E. State Parkway, Schaumburg, IL 60173. As a leading international supplier of direct drive and motion control components and integrated systems, ETEL supports high tech industry with linear motors, torque motors, positioning stages, and motion controllers/systems. For more information on ETEL’s motor products, call ETEL Product Specialist Brian Zlotorzycki at 847-755-55569. For information on all ETEL’s products and services, visit www.etelusa.com or contact Public Relations Manager Kathleen Stoneski at HEIDENHAIN at 847-519-4702.